CELEBRATING OUR PAST- HOW IT ALL STARTED. The Soup Kitchen was born out of a continued need perceived by Fr. William Grady, Pastor of St. Mary’s Catholic Church. Prior to establishing the Soup Kitchen, the UAW operated a kitchen at the YWCA. Because of the loss of manufacturing plants and an aging UAW membership in Muncie they announced they needed to close but the hungry still needed to be fed. The idea of operating a soup kitchen was supported by St. Mary’s Parish Council and they appropriated a grant of $10,000 to initiate the Kitchen. A board was formed with members of the three local parishes St. Mary, St. Francis of Assisi, and St. Lawrence. St. Lawrence provided us with a space to operate the kitchen in their former school. Shortly thereafter we hired our first director, Debbie Tucker and we were off and running. Those first years were not always easy which makes us especially thankful to all those who have dedicated their time, talents and treasures to this endeavor. The harvest soup kitchen progressed though the years and became an established nonprofit 501 c 3 organization. The board has grown to include members from all walks for life, professors, teachers, business professionals, hair design professionals. We strive to be all inclusive with our staff, board, volunteers and guests. Two years ago, we rebranded ourselves from the Harvest Soup Kitchen to the Soup Kitchen of Muncie. We kicked off the rebrand at our Annual Dinner and Auction in 2017. We performed a complete redesign of our logo and promotional materials and increased our social media presence through a redesigned web page, Facebook page and weekly blog blasts. In the last 5-10 years number of visitors to the kitchen have increased to between 34,000 and 37,000 per year meaning we serve between 68,000 and 74,000 meals annually since each visitor to the kitchen receives a hot meal and the sack lunch. We are truly located in a food desert in Muncie and the need is great. To keep up with this increased demand, our fundraising has become more extensive and we are extremely grateful to the supporters who generously contribute through the Annual Appeal Campaign, by Monthly Donations, at our Annual Dinner and Auction or through grants to the Soup Kitchen. We especially thank the Community Foundation, Maxon, Champions for a Safe Community, Ball Brothers Foundation, Friends of Muncie Endurathon, Tri Kappa and FEMA/United Way among others. As we look forward to the future, we will be increasing outreach to our community members for support and collaboration. Initiated several years ago, we host an annual picnic in July before school starts. We invite other nonprofits and community services that also assist our guests to participate in this event, making it easier for guests to be connected to resources in the community of benefit to them. As the picnic has grown, we established a neighborhood group to support each other and help serve people that live and work in the food dessert. This includes churches and neighborhood associations in the area around the soup kitchen. We, as well as others in the neighborhood group, have now joined the Food Council that is combating hunger in our community with collaborations between Ball State University, Purdue Extension agents, the food hub and other organizations that are working to eliminate food insecurity in our area and we look forward to this collaboration continuing well into the future. Soup kitchen of Muncie if the first line of help for many people in our community. As we start our 26th year we look forward to providing a safe place for people in need to come and share a meal. Now we have more ways to be connected so we can continue to get our story out to people who need to know about us and that can support us as we support others. A special thank you goes to our dedicated volunteers, past and present board members, community and individual donors without whose support we would not be able to continue this work of feeding the hungry in Muncie, Indiana. We cannot fight this hunger situation alone. Thank you for your support. Thank you for attending our annual fundraiser. Please visit our website, get connected to our email blast every week to know what is going on at the Soup Kitchen. Visit us on Facebook, like and share and spread the word. 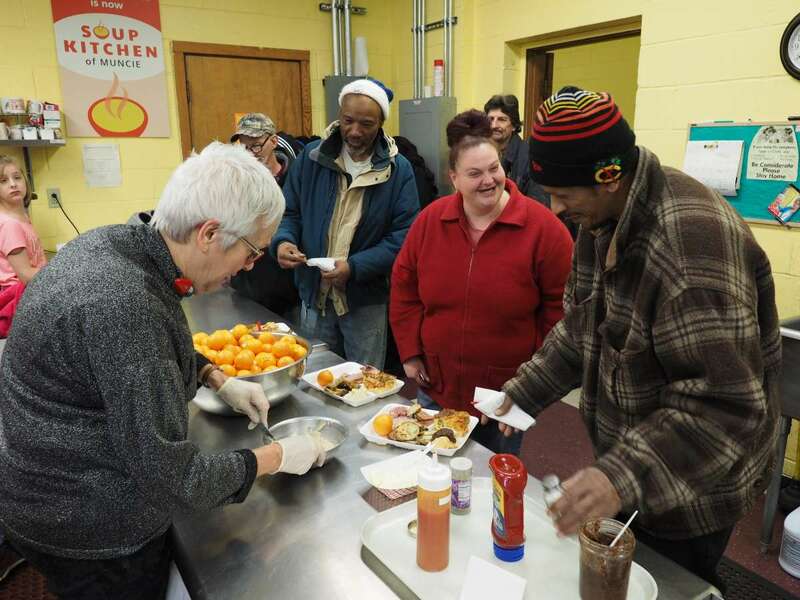 SEE ARTICLE ABOUT SOUP KITCHEN OF MUNCIE IN THE STAR PRESS ON FRIDAY MARCH 15, 2019. The Soup Kitchen will celebrate 25 years of service through its annual fundraising dinner 6-9:30 p.m. Saturday, March 16, at the Horizon Convention Center. The event will include a live auction, silent auction, raffle and more. Enormous gratitude should certainly go to Lois Altman for all her creative, continuous and dedicated work both in the kitchen and in fund raising.